Ready to take on India’s biggest city? For many backpackers, Mumbai is the starting point for exploring this incredible country. It’s a city of opposites – modern skyscrapers, swanky nightclubs and celebrity culture contrast with religious temples, ancient traditions and sprawling slums. Mumbai is mad, confusing, and definitely not for the faint hearted. But if you’re willing to embrace it, you might just fall in love! Mumbai is such a huge city that you could spend weeks exploring it. The majestic Gateway of India monument is a must see and a great place to start. Sharpen your haggling skills at the countless bazaars around the city, where you can shop for jewellery, spices and souvenirs, as well as tasting some of the world’s best street food. No trip to the home of Bollywood would be complete without catching a movie – head to the cinema or go straight to the heart of the industry at Film City. Beneath the city’s surface, you’ll discover green neighbourhoods, hipster bars and an amazing arts scene. Mumbai has an intense energy like nowhere else. The streets are constantly abuzz with cars, rickshaws, vendors, dogs, cows and people – LOTS of people. This means finding an amazing hostel for your stay in Mumbai is essential. It’ll provide a welcoming escape from the chaos – just what you’ll need to recharge, before heading back out to tackle this megacity . Read on to discover the best hostels in Mumbai for every type of traveller! A solo trip through India is a life-changing experience for newbie explorers and seasoned travellers alike. It’s the OG backpacking destination that keeps us coming back year upon year, with so much to discover that it can seem overwhelming – especially for solo travellers. But no fear – they can stay in one of these Mumbai hostels for a solid base to explore from, full of potential BFF’s and in-the-know staff! Solo travellers flock to this fun Mumbai hostel for many reasons, but top of the list is its friendly atmosphere – it’s all in the name! When they’re not socialising in the common areas, our lone wanderers love jumping onto one of the hostel’s group outings, like tours of the Dharavi slum or Mumbai’s famous cinematic areas. The hostel is located in an exciting neighbourhood that’s well connected to the rest of the city, so you’ll have no problem exploring. Head out alone or with new hostel mates – gotta love that solo traveller flexibility! This hostel is a sound choice if you’re looking to meet a diverse range of travellers – one reviewer says that ‘it was flocking with backpackers from all over the world’. It’s in a buzzing part of the city, surrounded by bars and with a market just over the road. Their funky themed dorms are styled after Mumbai’s transport services – there’s a red bus dorm, a yellow taxi dorm and a tuk-tuk dorm! If you’ve got a special someone, experiencing Mumbai is something you’ll want to share with them. The home of Bollywood glamour, vibrant colours, world-class sunsets and delicious food – sounds pretty romantic to us. These chic hostels ensure a cosy couple-friendly stay with all the usual social perks included. Just one look at Zostel and you’ll be hooked. It’s totally stunning, with a Bollywood themed rooftop lounge that’s seriously Insta-friendly – your grid is about to be overrun with #couplegoals. There’s a common area full of games and a café, not to mention speedy Wi-Fi and hot showers (two things you’ll appreciate if you’ve been in India a while – if you know you know). The hostel tours also happen to be extremely romantic – art galleries and sunsets over the Arabian sea? You better have that ring at the ready . This 100-year-old cottage was recently converted into a traveller’s haven with zen vibes – if you’re in touch with your chakras you’ll want to Namastay here . Hang out in the front yard around the huge jamun tree where your bunkmates will be playing games and soaking up the sun. It’s in the affluent community of Pali Hill, where you can treat your significant other to a fancy cocktail while you try and spot the celebs. Tucked away in a peaceful green oasis, Hostel Mantra will provide sanctuary after a day exploring the craziness that is Mumbai. It’s in a non-touristy area with loads of local delights to explore – particularly nightlife, which you can make the most of on one of the hostel’s bar crawls. They’ve got common areas to suit everyone – you can sunbathe in the garden, chill out on the roof or stream live sports on the big screen. Couples love their private rooms with en-suites – cosy AND budget-friendly! Mumbai’s nightlife scene is the biggest and most varied in India – from glitzy clubs to underground bars and ultra-cool live music venues. How do you pick the one that’s right for you? Easy. Just get started in one of these party hostels and see where the night takes you! In the hostel’s own words: “if you’re looking for a place to party your rocks off, this is it!” It couldn’t be easier to make friends and have a wild time in this lively Bandra hostel. Their nightly (beer-fuelled) events have a habit of ending in karaoke, so start practising your signature song now! Travellers are full of praise for the amazing staff, who not only provide the best insider travel trips, but also keep the atmosphere buzzing with games and events. They can’t wait to meet you! Locomo is known for its huge rooftop terrace with astounding views – you’ll feel like more of a baller than a backpacker when you’re popping bottles (well, beer caps) overlooking the city. They take their guests for karaoke nights at one of the chicest bars in town – where they’re treated to discounts – as well as pub crawls, family dinners and street food tours. Back in the hostel there are ping pong tables, a super comfy games room and a café to provide that much-needed hangover munch. There’s no denying that Mumbai can be intense. Every now and then you’re bound to crave a bit of personal space, total silence and a bathroom that you can stay in as long as you like without a queue forming outside the door. That’s where these hostels come in. Escape the chaos in your own room, then join in the fun in the common areas. This hostel describes itself as ‘an ancient oasis for the new age nomads’. Intrigued yet? You should be. Despite being in one of the most hectic cities on earth, Basti aims to pay homage to rural India, with rooms themed after unique Indian villages. They provide a free home-cooked Indian breakfast every morning, complete with a cup of chai, that you can enjoy on the roof terrace while you decide what to do with your day. If you’re stuck, one of Basti’s daily tours is always a wise choice! These hostels are too fabulous to be tied down to just one category, but we couldn’t finish without shouting them out. If you need a place to rest your head close to the airport, look no further than Qubestay. Not only convenient but also ultra-modern and spotlessly clean, Qubestay has independent cabin style rooms as well as capsule dorms, so privacy is guaranteed. There’s a quiet workstation with free Wi-Fi for all you digital nomads, and you can even fill up on a free buffet breakfast for added brain power! Wow – you don’t come across hosts like that every day! Another awesome hostel from the Backpacker Panda chain. This one’s located in Andheri East, surrounded by local restaurants and world-famous Indian street food, as well as being just steps from a bustling market. Expect laid-back vibes, story swapping and community spirit. There’s a shared kitchen, games area, clean dorms and stylish privates. Be sure to take in the views from the tranquil roof terrace, where you’ll also be able to join in with group yoga sessions. You’ll leave here with new friends and a much-improved downward dog! Which one of these top-notch hostels will you visit on your India backpacking trip? Let us know below! 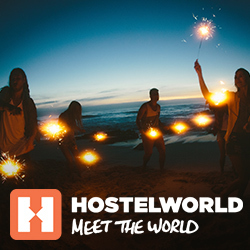 The post The best hostels in Mumbai appeared first on Hostelworld Blog.